Meningitis is a condition characterized by inflammation of the meninges, the membranes surrounding the spinal cord and brain. This inflammation may be produced by a number of different agents, including bacteria, viruses, fungi, and protozoa, and occurs in both acute and chronic forms. The most dangerous varieties of meningitis are of bacterial origin, some being capable of causing death within only a few hours of the onset of symptoms. The first sign of the disease is often vomiting, which is usually followed by an excruciatingly intense headache that develops from escalated cerebrospinal fluid pressure. Other symptoms may include confusion, drowsiness, fever, sensitivity to light, and a skin rash. Eventually, as the nerves along the spine become increasingly irritated, the neck stiffens, and, in some cases, the patient may experience convulsions, especially if the individual is very young. 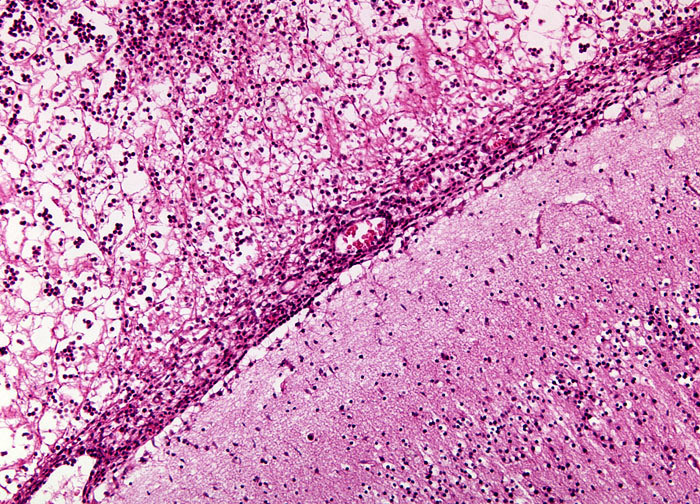 If acute bacterial meningitis is left untreated, the inflammation may lead to fluid build up in the ventricles of the brain, which can result in a loss of consciousness or even death.